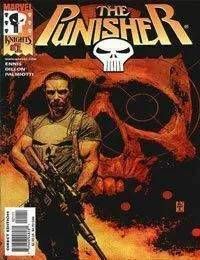 Frank Castle has gone back to basics. Back in New York, back from the dead and back doing what he does best: exterminating bad guys and waging his personal war on crime. The Punisher is here to clean up the mean streets of New York City, and the gutters are overflowing with drug dealers, mob scum and law-breaking skels. And just wait until you check out Franks new bachelor pad - with his roommate Death! Its a gritty tale of bullet-ridden, gut-wrenching action as you like it!